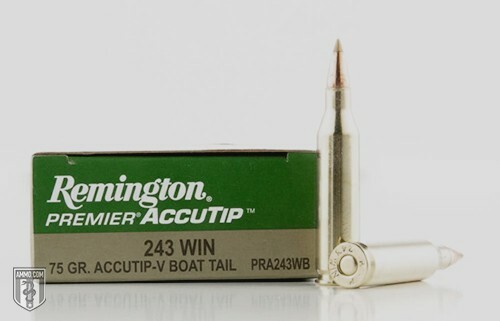 The AccuTip-V is Remington’s premier line of varmint control ammunition. Featuring a plastic polymer tip, thin jacket and swaged lead core, the result is amazing accuracy and a flat trajectory with high velocity. When this bullet impacts a target, it expands explosively – creating a kill shot almost every time. So if you live in an area full of coyotes, rabbits, gophers or any other creature that’s making your life rough, this type of ammo is going to be your best friend. If you’ve used a .22 WMR for varmints, you’ll be impressed by AccuTip-V's accuracy. Sure, a normal .22 round is accurate. But at distances greater than 100 yards or so, it loses strength due to its shape. These rounds are very aerodynamic, and you’ll know immediately that you’re using premium ammo. About 10 years ago, varmint ammunition exploded on the scene with the Remington AccuTip-V and the Hornady V-MAX. Remington uses a different-colored plastic polymer tip, but both of these rounds perform similarly on the range or in application. The deciding factor for varmint control is whether you (or your gun) prefer one brand over the other. When it's time to clean out those critters, the AccuTip-V is a great choice. Remington makes ammunition with this bullet type for all of the popular varminting calibers, including .17 HMR and .223. One of the main draws of this ammo is the way the bullet expands on impact. This ensures your target is going to have a swift death if hit near vital organs. The accuracy of these rounds guarantees a good kill rate, so long as you’ve got some good target practice under your belt. Unless you’re shooting through bushes or in a hurricane, you’re going to get a clean shot almost every time with the AccuTip-V line. Due to the high velocity and amazing accuracy, some shooters have adopted the AccuTip-V as their preferred backyard target shooting ammo. Able to shoot 100-yard groups as small as a half-inch, this ammo will perform admirably for all the shooting needs of the average sportsman.